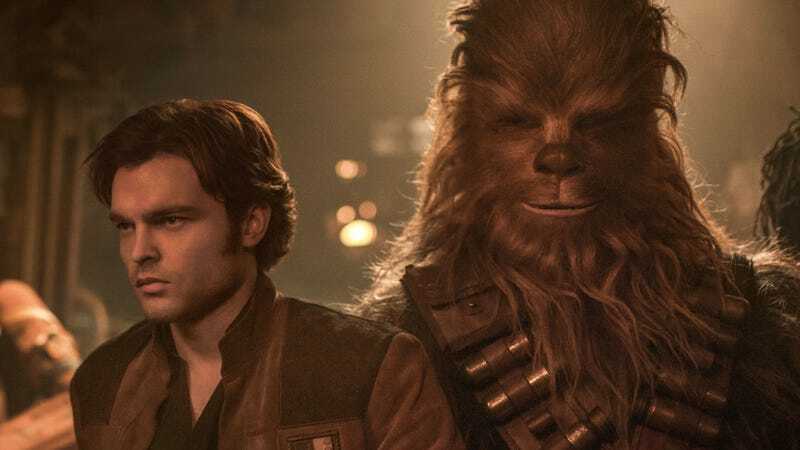 We finally get to see how Han and Chewie met in Solo: A Star Wars Story. Han Solo’s life has been full of iconic moments—the Kessel Run, winning the Millennium Falcon, running afoul of Jabba the Hutt and more, but none are more significant than Han meeting Chewbacca. So when Solo: A Star Wars Story, writers Lawrence and Jon Kasdan definitively decided on what that first meeting would be, they knew they had to be very, very careful, both on the page and on the set. In the movie, that drama plays homage to Return of the Jedi as Han is throw in a dungeon to face the wrath of a “monster.” A monster who we quickly recognize as Chewbacca. The pair then fight in the muddy pit before hatching an escape and uneasy alliance. Chewbacca, played by Joonas Suotamo. In a feat of scheduling that surely wasn’t by coincidence, the first meeting of Han and Chewbacca—a mucky fight that sets the tone not just for Solo but forms a cornerstone of the Star Wars universe in general—was put on the shooting schedule in a very specific place. We’ll have more on Solo next week, including the Kasdans discussing much bigger spoilers. It’s in theaters now.